Our family really enjoys Monster Cookies. I talked about this when I shared my homemade Monster Cookie Ice cream Recipe. 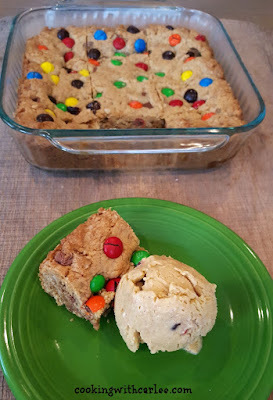 I made this monster cookie bars to go with the ice cream. For some reason it just seemed to me that if we were going to have monster cookie ice cream we should have monster cookies. Since monster cookies make such a big batch I decided to make these bars to treat the small dinner party I was having. They make a reasonable amount and of dessert and served as a nice base for the ice cream. I just now thought about how nice this dessert would be layered as follows: cookie bars, ice cream and a small serving of hot fudge topped with small candy bar pieces to tie it all together. (So much for being reasonable.) Too late to serve that to my guests but feel free to wow yours with my special dessert idea! These are great served warm out of the oven too. 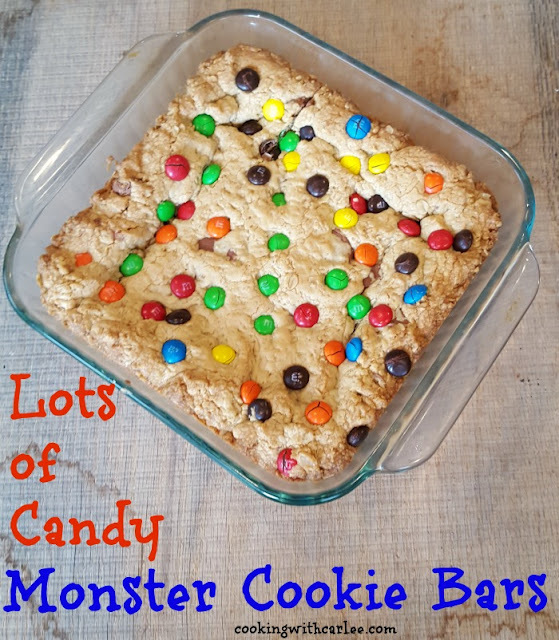 Carlee's Note: If you are looking for a really different way to have your favorite monster cookie flavors, MiMi also made a Monster Cookie Dip a while back that was completely addicting in the best sort of way! Preheat oven to 350 F and grease an 8x8 baking dish. Cream together the butter, eggs, brown sugar, peanut butter and vanilla. Stir together the flour, rolled oats and baking soda and then add into the creamed mixture. Mix until fully incorporated. Stir in the chocolate candy bars and M&Ms. Spoon into the prepared baking dish and bake for 20-25 minutes. How cute! I love all of the red white and blue stuff and you don't have to talk me into wanting a monster cookie! I am so glad you loved that dip. We've had it a couple of times too and every time I am amazed at how quickly it disappears! Ooh, these look delish! I can never resist a cookie bar :-) I love the idea of making them with red, white, and blue M&M's for 4th of July! Wouldn't that be so cute for the 4th? Now I want to make a batch for the weekend! I think I just found what my husbands lunch box treat is for next week!! I'm sure he'll love them! Yum! One of my fave cookies, only easier!! Yep! It doesn't get much easier than patting them into a pan and shoving them in the oven!